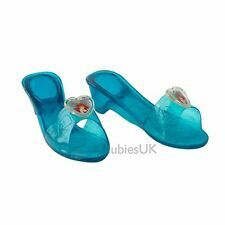 FANCY DRESS ACCESSORY ~ GIRLS DISNEY PRINCESS CINDERELLA JELLY SHOES. SMALL, MEDIUM & LARGE SIZES!! FAST POSTAGE!! Outfit includes Cinderella's beautiful tiara. Dress up as the Frozen sisters from the smash Disney film and prepare for the unexpected. Press a button to make your dress twinkle and play songs from the movie! The magic is enough to warm your heart and make you the envy of Arendelle! Share your first dance with the Beast in Belle's best-loved outfit: this golden dress captures all the glamour of the movie original. You'll love the layered effect as it catches the light, sending you swooning across the dance floor! Dress up as the popular favourite My Little pony Rainbow Dash with this gorgeous dress which features Rainbow Dash image on the front with incorporated rainbow tutu and Velcro attached wings to the back. 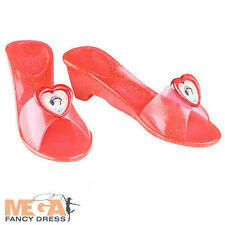 Size: 3-4 Yrs. Safety: Conforms to EN7-12 fire regulations. Includes: Tutu Dress & Headband. 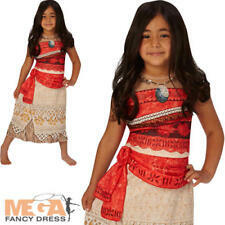 Size: 3-4 Yrs. Safety: Conforms to all EN7-12 Fire Regulations. 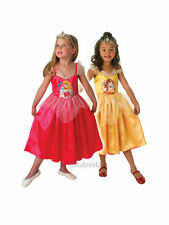 Includes: Satin Dress With A Gold Bow,Glitter Frill Neck Line & Long Glitter Detail Sleeves. DISNEY PRINCESS SOFIA THE FIRST. COLOUR PURPLE.